Our culture of mobile devices and tablets is increasingly pushing the idea that every year (or maybe two) we should be ditching the old model and replacing it with a nice, new shiny one. Last season’s model seems so dated and underpowered so quickly – and, would you look at that, all the cool new stuff only seems to run on the new version. With PC’s it doesn’t have to be this way. If you buy a decent machine you should have access to the insides where all sorts of bits and pieces can be improved upon or added to over time. This can stretch the life of your machine to something more like 5 years before it starts feeling a little old. Be aware that some computer manufacturers put warranty seals on their systems to prevent people from getting inside. It should be noted though that certain upgrades have a limited window of opportunity. Intel’s development cycle is about 18 months at which point something new gets introduced that may or may not be compatible with the last generation of motherboards or processors. If that happens then the current generation may vanish quite quickly from the market place and leave you struggling to find a replacement CPU. Other components are more generic and their connections tend to be around much longer. So it’s best to aim as high as you can in terms of processor as it’s the most difficult to upgrade down the line both in terms of availability and the physical fiddliness of removing the old one. Future proofing is kind of a mythical concept which implies that you can somehow buy a machine that won’t need changing or upgrading at any point in the future. There’s no reason why a machine you buy now can’t be doing the same job in 5-10-20 years, but there always seems to be some new feature that appears and tempts us down that never ending upgrade path. There’s really no telling how things will pan out and trying to be content with what you have is good for the pocket, and the soul – yeah, like that’s going to happen! What you can do is ensure that you make the most of the potential of the system you are buying. Memory – Find out if there are any slots free for upgrading. A system will commonly have 4 slots for sticks of RAM and the system may support up to 32GB so you’d need 4 x 8GB sticks to fill the slots. If you can only afford 16GB make sure they put in 2 x 8GB and not fill the slots with 4 sticks of 4GB which you would then have to throw away if you upgraded. Hard Drives – There may be ports on the motherboard to connect additional SATA drives. Make sure there are spare bays inside the computer to mount the drives and also spare power connectors and data cables. 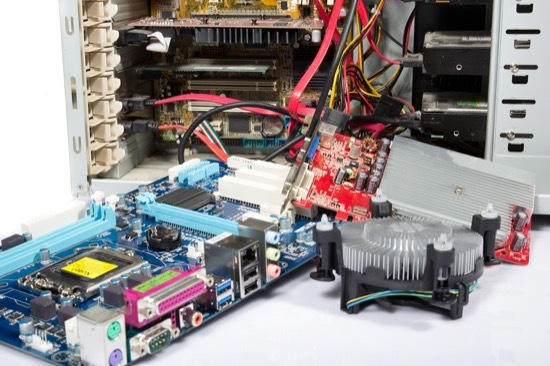 PCI/PCIe cards – If you intend to install a PCI or PCIe card firstly make sure that the right slots exist. The older PCI slots are disappearing fast so don’t assume it will have one. If you are adding a full length card then make sure the motherboard doesn’t have any components that will get in the way and that the case is deep enough to accommodate it. With these things in mind it’s possible to refresh and build upon a system down the line. A fresh install of Window is also a good way to bring back that new system feel and can remove unwanted software and the general computery detritus that inevitably gets picked up over time.